Shine Together is an organization dedicated to amplifying the awesome impact women have every day while simultaneously creating measurable opportunities for them around the world. We do so by celebrating and elevating women — many of them yet to be discovered - and providing a platform for them to celebrate and elevate each other. Our movement is organized around three core beliefs. First, we believe storytelling is among the most powerful tools for change - so our stories spotlight real women accomplishing extraordinary things. Next, we believe a combination of genuine mentorship and meaningful networking can fundamentally change a woman’s life and career - so we’ve committed ourselves to providing access to these crucial ingredients with high-impact community events. Finally, we believe in touching real lives with more than words - so we dedicate resources and funding to organizations that provide opportunities to women and girls. 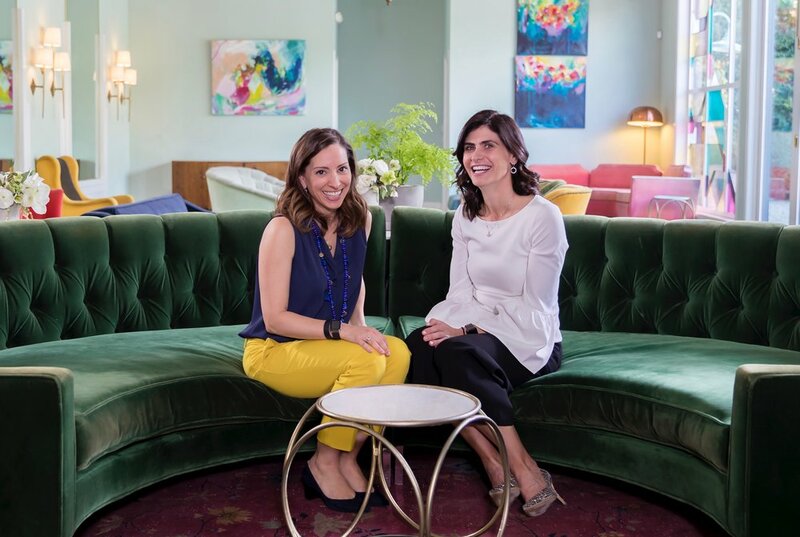 Founded in 2018 by Leah Busque and Jamie Viggiano, Shine Together was deeply inspired by Valerie Jarrett and the women of the Obama Administration. These impressive leaders were relentlessly dedicated to shining a light on the successes and contributions of their female colleagues. In 2013, the cultural journalist Ann Friedman and digital strategist Aminatou Sow gave this concept a name - calling it “shine theory” and challenged women everywhere to consider whether success might be contagious. We too recognize that success is limitless; the more it is celebrated and recognized, the more it will inspire future success. Shine Together is committed to the idea that women's stories deserve to be amplified to make a brighter future for everyone. We hope you join us in shining on! Recognizing oneself in someone else’s story is a powerful thing. We share relatable stories from everyday life to motivate and inspire others. We shine brighter when we all shine together. We welcome people of all genders, ages, backgrounds, and geographies to our community. Giving credit when it’s due should happen more often. We root for all shining women and provide a platform to amplify their voices. Positive change emanates from positive energy. We’re committed to building the brighter future we know is possible. Change only matters when you can feel it. We prioritize tangible, measurable actions that directly touch lives. We believe everyone is brilliant, and together we shine even brighter. @jimbovig - Jamie is the Co-founder and Executive Director of #ShineTogether. Jamie runs her own marketing consultancy focused on brand strategy for early-stage technology companies. Prior to that, Jamie was the VP of marketing at TaskRabbit where she oversaw brand and customer acquisition. Before joining TaskRabbit, Jamie led marketing for Humedica, a venture-backed healthcare data analytics company acquired by United Health. Previously, she held multiple marketing, sales and finance positions at Johnson & Johnson. Jamie received her MBA from Harvard and her undergraduate degree from the Wharton School at the University of Pennsylvania. @labunleashed - Leah is the Co-founder of #ShineTogether. She is also General Partner at FUEL Capital, where she invests in early-stage companies across consumer technology, marketplaces, and commerce. She’s passionate about supporting teams who are taking on world-changing ideas. Leah relates so well to founders because she is one herself. As TaskRabbit’s CEO Leah scaled the company to 44 cities and raised more than $50 million. In 2017, TaskRabbit was acquired by IKEA. Leah has spoken at the World Economic Forum and Tina Brown’s Women in the World Summit and has been featured in The Wall Street Journal, Wired, Fast Company and Time. @AdamMGrant - Author: Give and Take, Originals, Option B.; @Wharton professor; @NYTopinion: work/psychology; @TEDTalks. Shine Together is an organization dedicated to celebrating and amplifying the impact women have on the world — and providing a platform to celebrate and elevate each other. Please join us. Like us, Tacori believes that women are brilliant. Just as their jewelry celebrates life’s special moments – an engagement, anniversary, celebration – what matters to Tacori is delivering some shine that tells a story. With women at the heart of their business, they’re all about helping women shine even brighter.